A glimpse into our future? This week, it was reported that Sao Paolo, Brazil, is approaching crisis point. 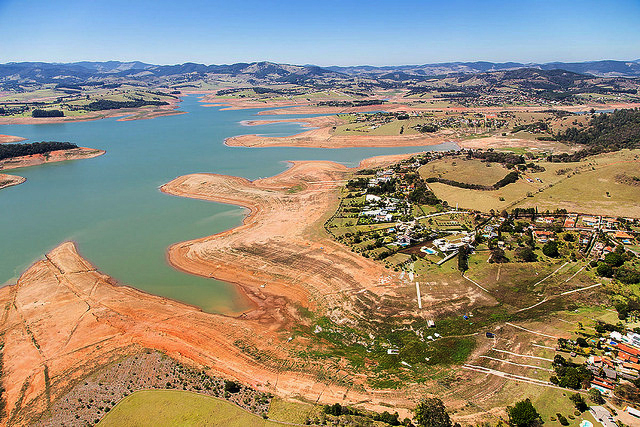 The 12th largest megacity in the world that 20 million people call home and the economic centre of Brazil has approximately 2 months worth of emergency water rationing remaining. What’s scary is that Brazil has (or is supposed to have) more fresh water than any other country. Extreme rationing is already in place, but the worst is yet to come as officials consider turning off water in various regions for 5 days per week. The Braganca Paulista reservoir, slowly drying up. This article by the BBC shows how desperate businesses are to continue operating: restaurants and bars using plastic cups to cut down on dishwashing (no mention on that environmental impact), small businesses buying water tanks to cope with the erratic rationing, and for businesses like launderettes and car washes, it seems the writing is on the wall. Similar to a former millionaire, the human race is unable to part with luxuries in order to survive. If you ask me, a car wash in a dust bowl is an unnecessary business. So what does this have to do with anything in Western Canada, you might be asking? You’ve probably seen that news article popping up all over your Facebook newsfeed about Nestlé – something about 200+ million litres of water and selling it back to BC. Well, never mind Nestlé’s track record for doing awful things, because the problem is larger than that. Currently British Columbia has no regulations on its groundwater, which means corporations are allowed to pull up as much as they want or need with zero cost to the company. With no permits to apply for, the fear is that companies employing fracking techniques (here’s what that’s all about) could permanently change the environment, leaving us all high and dry – pun, sadly, not intended. You know the kind of person I mean. He has to sell them because that kind of lifestyle is unsustainable. You can’t put millions of dollars on credit when you have no more money coming in. Similarly, with our water, there is a finite amount available. We can’t keep going down this road and ignore warning signs like Sao Paolo (I may be mixing metaphors.) We as a race are notoriously short-sighted, and with companies in control who are just looking at the bottom line, they’re going to drive us straight off the cliff, Thelma and Louise style. And no amount of money can buy a parachute for the CEOs: we’re all strapped down on this ride together. Sign the petition to protect BC’s groundwater.